NOFAS Gala — Love me enough. Faces of Fetal Alcohol. 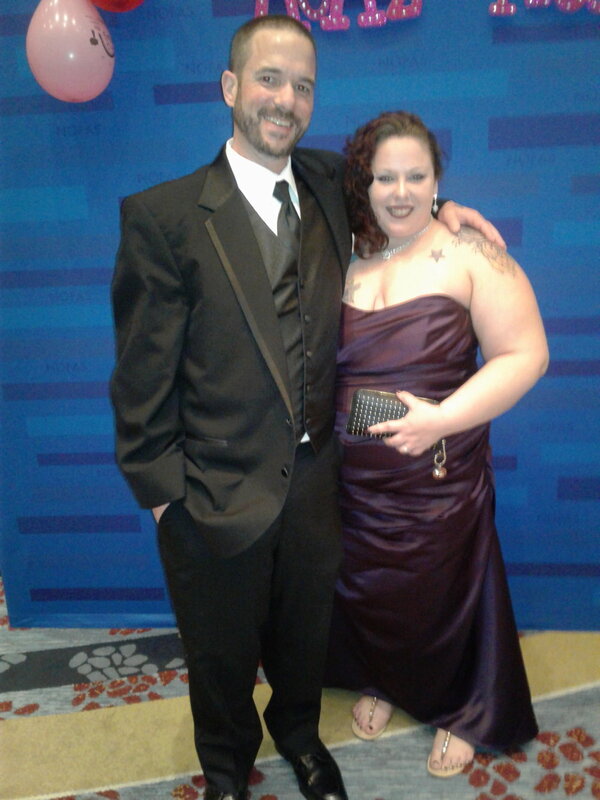 On November 7th, my husband and I flew from Oregon to Washington DC for the annual NOFAS Gala. This had been a dream of mine for 10 years since I first became interested in advocating for FASD. We spent the next day walking around DC and visiting the National Monuments and Memorials. We arrived back at our hotel with 2 hours to get ready for the Gala. Butterflies were in my stomach. My husband laced the corset on the back of my dress at least four times. My hands were shaking. I kept checking my wallet to make sure I had brought along the business cards to pass out. We arrived late to the Marriot Marquis. DC traffic is just awful especially at 6:00 PM in the evening. Once we arrived and figured out which floor of the hotel we were supposed to be on, we met up with my dear friend, Rebecca Tillou. This was our first time meeting in person. Rebecca and I met through my blog. Her book can be found in my Book Store on my blog. This was an absolute treat! Being able to share such a monumental evening with another adult affected by FASD was just fantastic. Rebecca had also brought along business cards promoting her book. We quickly decided it was time to walk around and make our presence known! So we jumped right into it! I politely interrupted people's conversations and introduced us. We gave them a little background on our projects and lives. I can't express how receptive these people were. It was amazing. People asked us questions and were genuinely interested and wanting to know more. We met a grandmother who adopted two grandchildren. They were a boy and girl about 12 years of age. They both had FASD and were just wonderful children. Their grandmother fought hard for those two. She spoke about the difficulties she had with schools and getting them the resources they needed. It was a battle I very much related to. Her story resonated with me. It brought light to the issues of the importance of schools, teachers, and guardians needing to be on the same page and working together to help these children succeed. I met a psychologist, Tatiana, who worked in the state of Oklahoma in a Pediatric department researching the effects of alcohol, utero, prevention, and child maltreatment. She was fascinating! We spoke about Canada and the UK being light years ahead of the US in it's research. She offered information on some great work being done by a woman in Vancouver, BC. She suggested it would be great to make connections with her when I got back to Oregon. I met a woman named Sheryl who was set to give her speech during the evening. She was an adult living with FASD and now worked as a substance abuse counselor. She had years sober and now dedicated her job as well as her free time to working with women and their addictions; acting as a guide, mentor, and helped them fight. I saw my own battles of addiction in Sheryl's story and was inspired at her courage and adherence. As she stood in front of over 100 people and told her story, I could barely breathe. Her bravery and ability to reach others was wonderful. The whole crowd stood and applauded. I met Sister Suzette, from the Sisters of Notre Dame, who co-founded the Double Arc. It is a non profit that assists children and families affected by FASD. Sister Suzette specializes in FASD and is an absolute angel. She, like many of the people I met that evening, worked on the front lines of this disorder; working personally with women struggling to be clean and sober and working to get them help, recovery, hope, and healing. She sat at the table with us and my husband and I spoke openly with her about our addictions, recovery program, dual diagnosis, and the power of such programs. Sister Suzette was awarded for her unbelievable, educational, and influential work. I met the Vice President and spokesperson for NOFAS, Kathy Mitchell. This woman is the true definition of fighter and motivation. She has worked as a speaker of FASD all over the world, she has worked as a substance abuse counselor, she has served on panels for the WHO (World Health Organization) specifically on pregnancy and substance abuse, and has created phenomenal mentorship programs such as Warrior Mom Network. She left me yearning to do more than I am now, and sparked a light in me to push my advocacy to legislation. She sat at the table next to us and carried herself with so much purpose, fortitude, and energy. She spoke to us all on the work of NOFAS. This organization is responsible for so much positive and life changing work. The networks they have pulled together are astonishing. NOFAS has managed to build a community in where resources, information, help, and hope are not only achieved, but passed along in inspiration to create more organizations similar. We heard speeches on Neurotoxins and their links to FAS, Flint Water, Puerto Rico's waters, and the research being developed from it. Leaving this evening left my husband and I with more purpose than we had entering the evening. The knowledge and faith we were left with amplified our dreams. Change is so very special. It is at the tips of our finger tips waiting to brush against the light in others. We can do so much together. This journey has only begun. I am aware of my focus and am thrilled to see how far I can take this dream. Please, please, introduce yourself with NOFAS and all they do. It's now our time to shed light on Fetal Alcohol Spectrum Disorder and change the face of this disorder.